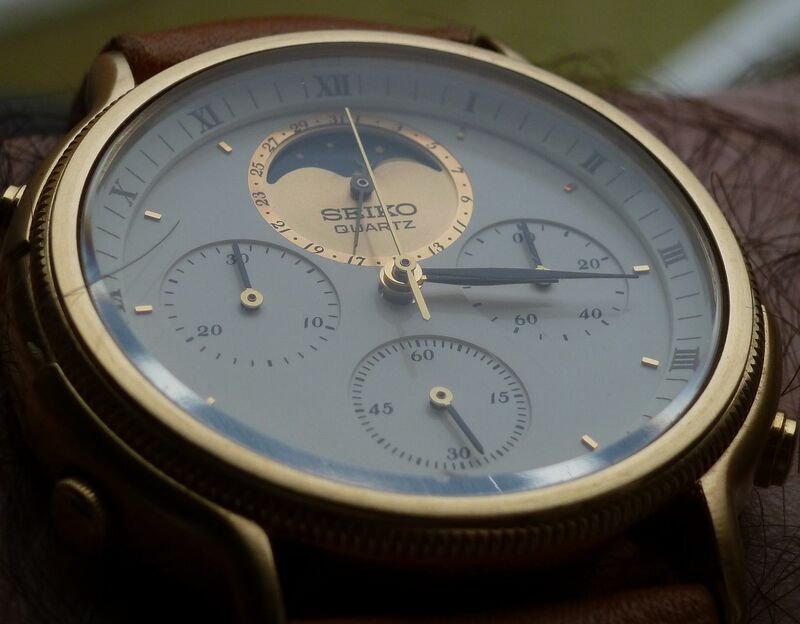 It is easy to see that this Seiko 7A48-7040 has certainly seen better times. I decided to rename it “The Old Knight“, since the seller had replaced the original band with a stainless steel mesh-type bracelet, that reminded me of the mail armour soldiers used to wear during battle. The screw on the dial is also pretty bad rusted, and impossible to remove (for the moment). The battery presented some signs of acid leak, but the compartment was clean. New battery in, and the watch came to life, with all functions working perfectly. All pushers were stuck to some degree, but the problem was corrected after a throughout clean of all parts of both the case and the movement. One switch lever (the chronograph start one) was almost completely rusted stuck in pressed position, but still intact. I managed to carefully remove it from the movement and clean it out. It is now working perfectly again. As bad as it may seem, once cleand and properly oiled, the movement works perfectly well. If I manage to remove the dial and replace it with a nicer one, I might as well replace also the scratched glass. If not, I will keep it for spares. Shame about the dial George, the sunburst moon-phase is the best part of the watch in my opinion. Yeah, disappointingly (and deliberately) out of focus George. I hope you didn't pay too much for it. actually no, not that much. The seller accepted my way lower offer so I am pretty fine with it, actually. I am getting another 7a48, which might need some spare parts, so it might come in handy, actually. I am considering if I should make of 2 watches one, using the best pats from each of the watches, since the working movement has not only a damaged dial, but also a screw which has damaged also the main plate, while the new one is basically perfect, apart some debris of the acid-eaten circuit block. I guess the best option is to take the best parts from each, and assemble a completely "new" movement. I am incredibly satisfied. The band I temporarily took it from the 7A34-7000, so this is just a mock up, but it fits perfectly. The glass is scratch-free, and the case itself has little to no marks at all. Only the back cover has a couple of very tiny scratches, but apart from this, it is almost NOS. What is it with you two ? A mutual admiration society ? That's a nice combination- great work!! !